Even though I live in Switzerland where Weleda is quite a popular brand and I myself have used several of its products before, I realized, I knew very little about its history and tradition. So to kick off this special Weleda natural beauty and holistic health series, let’s look at how it became the brand it is today. This will also show why I think Weleda is the real deal amongst natural beauty brands! If you, like me, believe that we are best served when seeing and treating our body, mind, and spirit as a whole, then you will fall in love with how Weleda came to be and what it stands for. The Weleda website offers a wealth of information (another very good sign of a brand that can be taken seriously) and serves as the main source for this post. Weleda was founded in Arlesheim, Switzerland in 1921 by three intellectual and spiritual pioneers: Rudolf Steiner, Dr. Ita Wegmann, and Oskar Schmiedel who based it on the philosophy and spiritual movement of anthroposophy. Anthroposophy, created by Steiner at the beginning of the twentieth century, postulates that human beings should see their body, mind, and spirit as intrinsically linked and as part of a larger holistic system. The movement went through different stages of philosophical focus and eventually led to the creation of institutions and fields such as the Waldorf education system, biodynamic agriculture, and anthroposophical medicine. The Goetheanum in Dornach, Switzerland is today’s international center of the Anthroposophical Society. I had not heard of anthroposophy as a movement before, even though I have a keen interest in the body, mind and spirit connection. I know the Waldorf school system a little since there is a Steiner school very close to where I live and I know people who were students there. It has always peaked my interest as the system seems to prioritize individual needs and talents much more than a strict curricular schooling and grading system. In the late 1910s, Steiner started collaborating with doctors and chemists to rethink the conventional approach to medicine. Dr. Ita Wegmann and chemist Oskar Schmiedel joined Steiner in developing a new way of healing the body: While they acknowledged the immense ability of the body for self-healing, they also realized that sometimes it needs some help to activate this ability. With this knowledge in mind, they created a personal approach to health care and medicine based on natural ingredients that help the body self-heal. So the philosophy at the core of Weleda’s vision is one of holistic health and beauty. The body is seen as a part of a larger whole and with innate self-healing abilities that ought to be supported and activated instead of bypassed or ignored through medicine and cosmetics. This is integral to everything Weleda does and that, to begin with, has me feeling quite positive about their intention and how they look at the human beings they want to help with their products. According to the website, some of Weleda’s oldest products are Rosemary Hair Oil (1922), Arnica Massage Oil (1926) and Skin Food (1927), for example. Later followed by classics such as Lavender Bath Milk (1961), which I love to use before bed, as well as a baby and child care range based on calendula amongst others. Weleda continuously expanded all over the world and by 1992 was represented in thirty countries, carrying 10’000 products. Weleda now has over 90 years of experience in anthroposophical medicine and natural cosmetics! So How do Weleda Products Fare in Terms of Natural Beauty Quality? In times of green washing and green brands popping up left, right and center, it’s hard to identify the ones that are truly built around the idea of natural ingredients being best and can also back up their claims. Using the Thinkdirty app, I checked several of Weleda’s products and was pleased to find all of them in the 0-3 range, with many scoring a perfect 0. The 0-3 range means the product “does not contain any ingredients which have a documented potential negative health impact” (see Thinkdirty Methodology.) This alone is great news but as we all know a product is much more than just its lack of chemical ingredients. 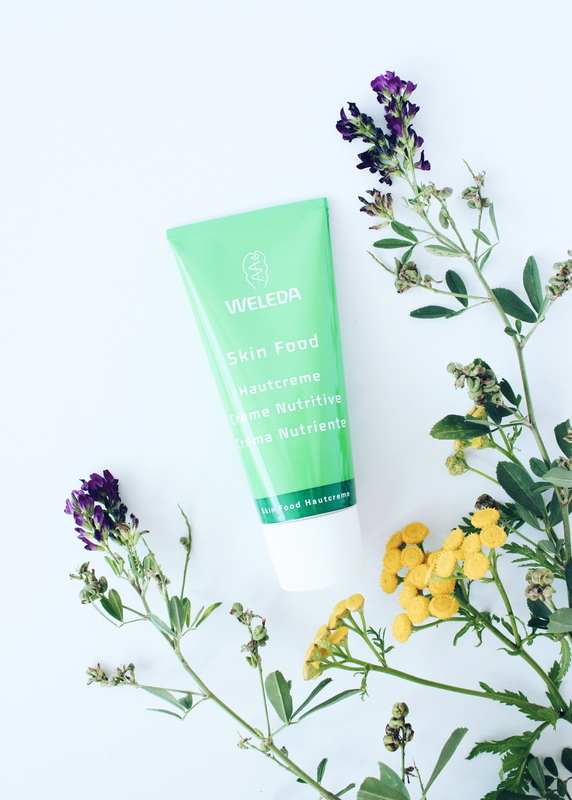 Weleda Skin Food, the face cream that has been around for over 90 years, is a green beauty favorite among makeup artists and beauty bloggers and it, too, scores a grade 1 on Thinkdirty. Celebrity green makeup artist Katey Denno swears on it and keeps it in her makeup kit at all times and Trace Barnhill from intothegloss.com termed it “the $12 La Mer dupe” because it is such a champion beauty item at such a low price. I researched the different uses of Skin Food and found that besides being a wonderful cream to treat dry and itchy skin, people kept mentioning it as a great highlighter! I have only used it for a few days and so I can’t attest to its other uses yet but as a highlighter, it works great: It has a nice shine to it and goes on smoothly over my foundation. I only put very little on my cheek bones and I very much like the dewy shine it gives to my skin. Plus, it smells great! Skin Food contains the following ingredients: Water (Aqua), Helianthus Annuus (Sunflower) Seed Oil, Lanolin, Prunus Amygdalus Dulcis (Sweet Almond) Oil, Beeswax (Cera Alba), Alcohol, Polyglyceryl-3 Polyricinoleate, Glycerin, Limonene*, Viola Tricolor Extract, Fragrance (Parfum)*, Hydrolyzed Beeswax, Sobitan Olivate, Rosmarinus Officinalis (Rosemary) Leaf Extract, Chamomilla Recutita (Matricaria) Flower Extract, Calendula Officinalis Flower Extract, Arginine, Zinc Sulfate, Linalool*, Geraniol*, Citral*, Coumarin*. * from natural essential oils. I will cover the lead plant philosophy of Weleda and its core ingredients in a later post. Considering its early beginnings and consistent place among natural beauty brand favorites, it’s not surprising that Weleda has managed to stay at the forefront of natural beauty and holistic health. Stay tuned for the next post about Weleda’s core values and how they are reflected in their products. In today’s world where values are such an important driving force, it’s lovely to find a brand that is sort of my spirit animal when it comes to green values.